For museum lovers visiting Japan, skipping the Tokyo National Museum is equivalent to giving the British Museum a miss when visiting the United Kingdom. 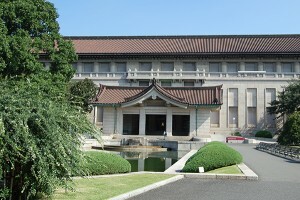 As the first, oldest and largest national museum in Japan established in 1872, the Tokyo National Museum has been a natural port of call for many including the Sainsbury Institute. Over the Institute’s much shorter history of 15 years, there have been a number of collaborative projects including working on exhibitions to holding scholarly lectures. One of the most recent joint ventures was holding the Second Ishibashi Foundation Lecture Series at this prestigious museum in October 2014. This official collaboration created an opportunity to invite two archaeologists working in Britain to discuss the Euro-Japanese archaeological exchanges from the 19th century to today. The Tokyo National Museum with a history spanning over 150 years was built with West-oriented vision and modernization as the driving force. For the Institute, the museum was the ideal partner to explore such relationship. An embodiment of both old and new modernized Japan, the museum was built in the Victorian style on the historic former site of Kaneiji temple’s main hall in Ueno. Inviting Josiah Conder as the architect, the museum was part of the grand vision of Machida Hisanari, who aspired as the first museum director to transform Ueno into a living encyclopaedia. 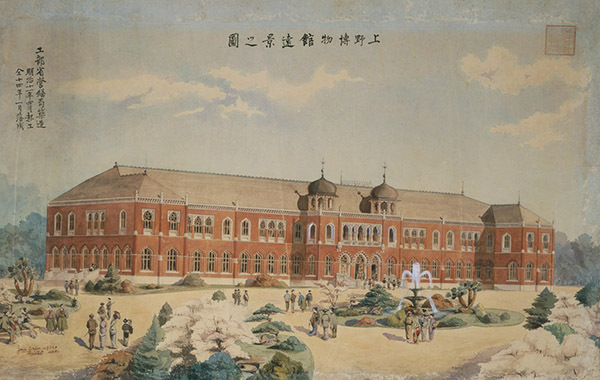 Machida’s ambitious project involved the construction of a museum for art and natural science, together with a zoo, botanical garden and library. With his first-hand experience from studying in England as one of the Satsuma 15 group of students, he had a firm understanding of the potentials cultural institutions had on strengthening the nation. Having observed many museums including the British Museum and key world expositions abroad, he was determined to introduce a large-scale museum in Japan to help position the country as one rich in cultural and historical heritage with a modern global future. The original museum was an impressive two-story brick building. It was completed in 1881 and quickly became one of the key symbols of cosmopolitan Tokyo as Japan modernised. History has played its part in bringing about changes as the museum saw ownership transferred to the Ministry of Agriculture and Trade in 1881, then to the Imperial Household between 1888 and 1924. In 1924 the museum and the zoo were given to the city of Tokyo as a wedding gift to the nation by the Crown Prince Hirohito (the future Emperor Showa) on his marriage. The fabric of the museum has also seen changes. The Great Kanto earthquake in 1923 damaged a proportion of Conder’s iconic Victorian inspired building and has since been replaced with the present Honkan main building designed by Jin Watanabe in an Eastern “Emperor’s crown” style. The museum despite shifts large and small continues to exercise its influence; Over 1,550,000 visited in 2012 alone to see some of the over 114,000 objects housed in the museum including 87 works designated as National Treasures and 633 as Important Cultural Properties. Under such historic gravitas as witness, the Second Ishibashi Foundation Lectures Series organized by the Sainsbury Institute and Tokyo National Museum took place inside the museum’s Heiseikan building on 25 October 2014. The lecture series first introduced Dr Simon Kaner, Head of the Centre for Archaeology and Heritage within the Sainsbury Institute, who spoke about William Gowland, another influential foreign specialist in the late 19th century, and his fascination with Japanese burial mounds. Simon drew on Japanese archaeological materials in two national collections in the United Kingdom, the British Museum and the National Museum of Scotland to explore archaeological interrelationships between Japan and Europe from the 19th to the 21st centuries, the significance of Japan-Europe research networks for the development of world archaeology, and the role that archaeology plays now and in the future in culture and society. Dr Oliver Craig followed, who spoke on new scientific approaches applied in European archaeology. Delving into the subject of molecular archaeology, Oliver focused on investigating the diet, food and cuisine from the Stonehenge to the Jomon. From the pots and soils still smeared with soot and grease to the animal teeth which contain chemical ‘passports’ betraying their geographical origin, Oliver gave illustrated accounts on how advances in archaeological science have revolutionised the study of prehistoric food, cuisine and consumption to provide a window into the daily lives and ritual activities of Late Neolithic Britain. A discussion on Euro-Japanese archaeological exchanges moderated by Shirai Katsuya, chief curator of archaeology at the Tokyo National Museum, shed light before closing the event on how the two cultures have shared and developed through mutual interests over the centuries. Partnership with Tokyo National Museum has been an important relationship in much the same stride as seen in the archaeology field. The Institute hopes to continue nurturing the link at an academic level. 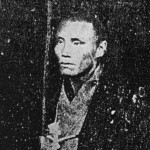 Portrait of Machida Hisanari from Dainihon Meika Shōzō Shū (A Collection of Portraits of the Celebrities of Japan), Keizai Zasshi Sha, 1907 (reprint,Yumani Shobō, 1988).